The MR38 & MR48 are Multiple-Step Rotating Point machines featuring overhead rail and continuous duty operation. 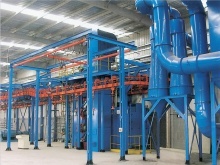 These machines can be used to clean rust and sand from casting and work pieces to be fitted to vehicles such as bolsters and side frames, as well as other types of steel structure and mechanical parts. 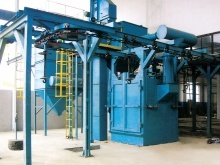 These machines can be integrated in wet and powder paint lines and are very efficient and low cost maintenance. The MR58 Series features hanging chain type continuous duty overhead rail shot blasting machines used for batch cleaning of small to medium sized castings, forged parts and alloys.